Are you going to go out and buy a costume for Halloween? How about your oatmeal? Is it going to have a costume? Dressing up your oatmeal is going to be much easier than trying to get your two year old to wear that witches hat. All you gotta do is add some ORANGE (not food coloring) and you have Halloween oatmeal. I added both grated sweet potato and apricots to get that orange color. And do you know what else you get? You have just added a ROCKSTAR of nutrition to your oatmeal. The Center For Science in the Public Interest named sweet potatoes one of the best vegetables you can eat! Sweet potatoes are loaded with carotenoids, vitamin C, potassium, and fiber. Yes, you just took your hot whole grain breakfast and turned it into the breakfast of champions. I'm not sure which champions I mean exactly - just choose your own champion. I used to HATE oatmeal because I had only tried instant. Now, I really like it - and I keep thinking of ways to make it better. This recipe will be gluten free if you can find gluten free oats. Bring 5 1/2 cups water to a boil and add oats, sweet potato, and apricots. Reduce the heat to very low, cover, and simmer, stirring occasionally. When sweet potato and oats are cooked (about 15 minutes), add salt and vanilla. Serve with raisins, milk, maple syrup, honey, etc. This recipe will keep in the fridge for one week. I eat oatmeal (slow-cook - the real stuff!) for breakfast every day after my morning run. I typically add banana & a little almond butter. The secret is putting them in right at the beginning to let it cook all together - amazing! I top with berries and a little Greek yogurt. So good, especially in the winter! I don't understand how people don't enjoy oatmeal--> it's one of my favourite foods. Peanut butter & banana are necessary add-ins! Pumpkin puree is another way to dress up your oatmeal for Halloween! Just add a little cinnamon and tiny bit of honey for sweetness! I just added pumpkin to my oatmeal today! I also love adding frozen fruit before it cooks so it defrosts with the hot oatmeal, so good! I cook my oatmeal with milk (totally yummy!) and then add craisins and a bit of honey. sweet potatoes or pumpkin sound great as well. My husband refused to eat oatmeal until he tried steel cut oats. They cook much longer than rolled oats. You can cook them in a crock pot overnight or soak them in milk over night for a faster cooking time in the morning. We like ours with dried cherries and walnuts. In reply to Khushboo who said "I don't understand how people don't enjoy oatmeal..." - I have a interesting reason that my Grandpa hated oatmeal. He grew up in a orphanage and his staple food there was oatmeal, it literally became a food he associated with bad memories and taste, so as soon as he got out of there he never touched oatmeal again! He would talk about how much he hated it. I on the other hand like oatmeal, and I even like the instant. I normally add cream and sugar but I like the orange idea! 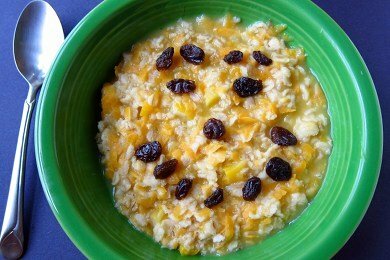 Hot, old fashioned oatmeal takes a short time to simmer; spoon it into a shallow soup bowl, add a large dollop of applesauce in the middle, cold, from the fridge, and a sprinkle of cinnamon-sugar overall. Yum! I use quick oats w/ dried fruit bits, golden rasins, cinn. and warm apple juice instead of water...sooo good! I add frozen blueberries to my daughter's oatmeal to cool it down quickly so it doesn't burn her little mouth! I just put pumpkin puree and frozen BB in mine this morning. I love how the frozen fruit cools it down quickly. I also make the baked this way. Oatmeal is one of my favorite foods. I also just made oatmeal this morning with pumpkin puree, raisins and maple syrup. You can also add alittle vanilla and an egg and bake it. It is a yummy healthy after school treat. I add blueberries every day. I sometimes include honey and cinnamon too.